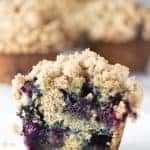 This recipe for healthy banana blueberry muffins is a makeover for our more indulgent banana blueberry muffins with crumb topping. We have reduced the fat and calories and increased the fiber while keeping the muffins moist and tender. The crunchy crumb topping is completely fat-free. It has a touch of lemon in it to make all the flavors ‘pop’. You’re going to love these muffins. I hate to admit it, but I eat way too much butter (said my hips and thighs). I try to balance my love of butter and bacon with healthy alternatives so I can still fit into my favorite jeans. But healthy needs to be tasty too, or it just isn’t worth the trouble. These healthy banana blueberry muffins are definitely worth making. We kept a small amount of fat in the muffins to help retain the moisture and keep it soft and tender. The fat is a much healthier unsaturated fat than the butter that we used in the original recipe. 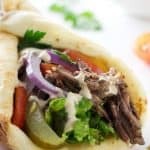 We used olive oil but avocado oil is another great choice. Actually, we highly recommend avocado oil because it is flavorless and will not change the flavor profile of the muffins. 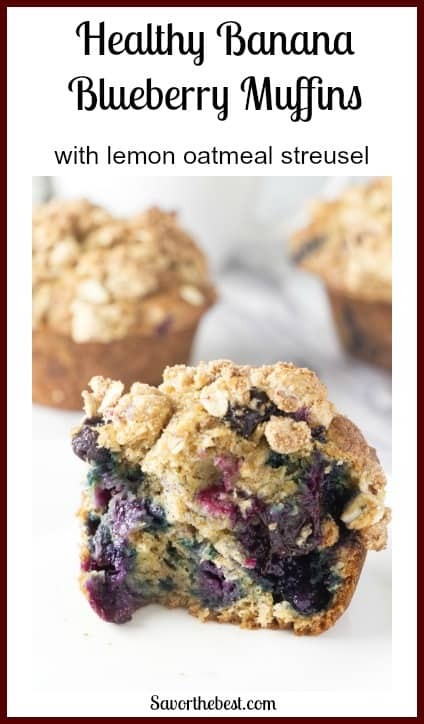 WHERE IS THE RECIPE FOR THE HEALTHY BANANA BLUEBERRY MUFFINS WITH LEMON OATMEAL STREUSEL? 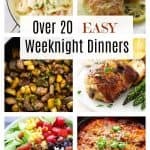 Are you in a hurry for the recipe and want to skip all the helpful tips and tricks? No problem. All you need to do is scan down to the bottom of the page. The recipe for our healthy banana blueberry muffins is in a convenient, printable recipe card at the bottom of the post. 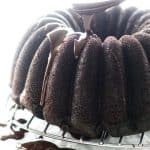 However, if you want some indispensable baking tips, helpful information, and other suggested recipes, then stick around and peruse through the entire post. Who knows? 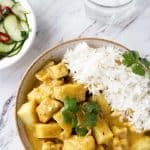 We might answer a question that could come up as you make this fabulous recipe. HOW MANY CALORIES ARE IN THESE HEALTHY BANANA BLUEBERRY MUFFINS? There are 201 calories in these healthy homemade muffins. Our original recipe for banana blueberry muffins has 336 calories. That is a significant calorie savings! In the original muffins, 20 percent of the calories come from fat but in this healthier makeover recipe, only 5 percent of the calories come from fat. Our original recipe is pretty high in fat with a whopping 12.8 grams. 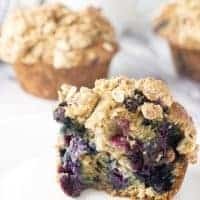 These healthy banana blueberry muffins have 3 grams of fat in each muffin and the crunchy streusel topping is completely fat-free. We have also cut out all the cholesterol and reduced the sodium. As an added bonus, by replacing some of the all-purpose flour with whole wheat flour, we have bumped up the fiber. We added lemon to the batter and the streusel topping for a nice ‘zesty’ flavor. DID YOU SAY THE STREUSEL TOPPING IS FAT-FREE? Yep, you read that right. The oatmeal streusel topping is a healthy, fat-free, crunchy crumb topping. And it tastes delicious. Normally, a yummy, crumbly, buttery, streusel topping is made with (wait for it) BUTTER. And who doesn’t love butter? Butter is flavor. But it is also full of fat and calories. We used oatmeal and whole wheat flour in the crumbly, fat-free, streusel topping. Instead of binding it together with butter, we used an egg white. Not only is the egg white fat-free, but it is full of protein. BONUS! And another bonus is that the egg white makes the streusel topping super crunchy after it is baked. 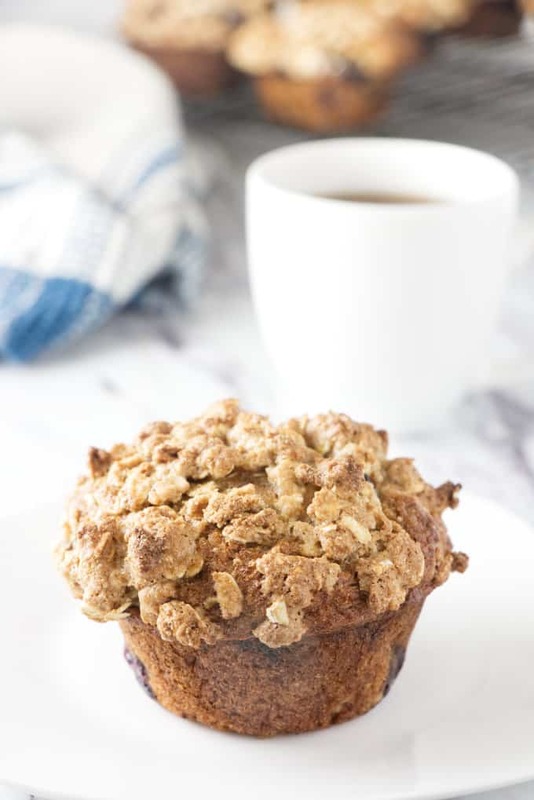 An important tip to keep in mind when you make the streusel topping is the size of your egg. One large egg has about two tablespoons of egg white. If you use a small egg, you should have just enough egg white for the recipe. But if you use a large egg, you may want to leave out some of the egg white. Another option is to use a pre-packaged carton of egg whites and just measure out 1-1/2 tablespoons. These muffins get baked in a regular sized muffin tin that holds just a little over 1/3 cup of batter in each little muffin-maker-cavity. We filled each and every one of those muffin tins to the very top. You don’t have to do that if you want slightly smaller muffins. 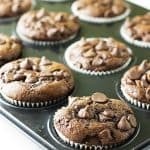 If you fill the little tins only 3/4 full then you can get 18 to 19 muffins out of this recipe and each muffin will only have 160 calories. We wanted tall, pretty muffin tops on these muffins so we packed all the little tins completely full. Now, before we go any further, I should warn you that not all muffin and cupcake recipes will work well if you fill the muffin tin all the way to the top. There are some muffin and cupcake batters that will spill all over the bottom of your oven if you fill it to the brim. So make sure you follow the instructions of each recipe and don’t transfer these instructions to a different recipe. This batter is pretty thick and it raises in a nice little mound so it won’t spill out and over the edge of the muffin pan. The other thing you will notice in the instructions is that you need to start baking the muffins at a really high heat for the first five minutes then turn the heat down for the rest of the bake time. That initial burst of high heat will give the leavening a ‘head start’ and make the muffins rise taller. You don’t want to keep cooking the muffins at the high temperature or they will cook too fast and burn. So after five minutes, turn the heat down and finish baking them at 350°F. A healthy banana blueberry muffin and a cup of coffee to start the day. The muffin recipe does call for a small amount of fat. Instead of a whole stick of butter, we are using two tablespoons of olive oil. That small amount of fat makes a big difference. If you eliminate the fat completely, the muffin won’t be as tender and moist. The fat also helps the muffin stay moist longer. However, since it is significantly lower in fat than our original recipe, these low-fat muffins will dry out faster. We recommend freezing the muffins if you are not going to eat them within three days. 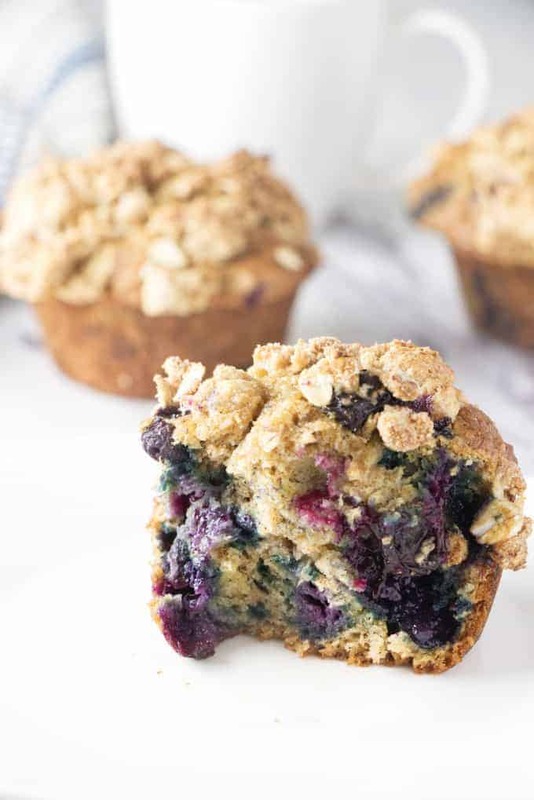 CAN I USE FROZEN BLUEBERRIES TO MAKE THESE HEALTHY BANANA BLUEBERRY MUFFINS? Absolutely! Frozen blueberries will work great in this recipe but make sure they are still frozen when you add them to the batter. If you thaw the blueberries before adding them to the batter, you will have a messy muffin and too much liquid in the batter. The juices in the blueberries will turn the entire muffin purple but more importantly, it will increase the amount of liquid in the batter. The extra liquid will throw the whole recipe off and make the muffins heavy, dense, and gummy. So if you are using frozen blueberries, keep them in the freezer until it is time to add them to the batter. The frozen blueberries will still release more liquid into your muffins when you bake them but it won’t affect the outcome of the muffins because that liquid does not get stirred into the batter. Since frozen blueberries will release more liquid than fresh blueberries, the berries will tend to sink to the bottom of the muffin. You can solve that problem by coating the blueberries with a bit of flour. Just toss a couple of tablespoons of flour into the frozen berries before adding them to the batter. The final tip to keep in mind if you use frozen blueberries is the cooking time. You will need to add a couple of minutes to the total baking time if you start with frozen berries. Depending on your oven, it shouldn’t take more than two minutes longer. Just stick a toothpick in the center of the muffin to see if it is done. Here is a quick shopping list of the groceries you will need to make this healthy muffin recipe. If you keep your pantry stocked well, you probably already have most of these items. Check out our video and see how easy it is to make these healthy homemade banana blueberry muffins. This healthy banana blueberry muffin recipe is a makeover for our more indulgent banana blueberry muffins. These muffins are low in fat and calories and high in fiber but they are still moist and tender. The crunchy crumb topping is completely fat free. Grease 12 standard sized muffin tins or line them with paper baking cups. In a medium bowl, whisk all the dry ingredients together then set aside. In another bowl, whisk the egg whites, and both sugars then add the oil, vanilla and lemon zest and beat until well blended. Next add the mashed bananas. Fold the wet mixture into the flour mixture then fold in the blueberries. Blend the oatmeal, flour, sugar, and lemon zest together then stir in the egg white until the mixture is moist. Fill the greased muffin tins completely full then sprinkle the tops with the streusel topping. Bake in the preheated oven at 425°F for 5 minutes then turn the oven down to 350°F and bake for 12 to 15 more minutes or until a toothpick inserted in the center comes out clean. Allow the muffins to cool completely before removing from the muffin tins. 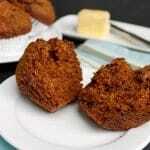 The tender muffins can fall apart if you remove them while they are still warm. If you are using frozen blueberries, do not thaw them before adding them to the batter. Toss frozen blueberries in a couple of tablespoons of flour first. This will prevent the blueberries from falling to the bottom of the muffin. Fill the muffin tins all the way to the top and bake the muffins at 425°F for 5 minutes then turn the oven down to 350°F for the rest of the baking time. The initial burst of extra heat will help the muffins rise taller but don't forget to turn the oven down after 5 minutes or they will burn. Don't open the door of the oven when you turn the heat down. 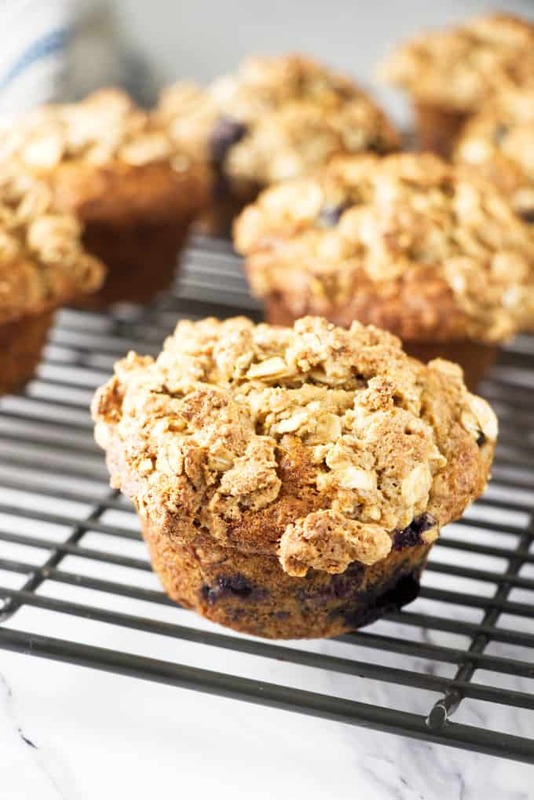 Have you made these healthy banana blueberry muffins? We would love to hear from you. Drop us a comment below.